The research on the interactions among multiple ecosystem services (ES) is a hotspot. Most of the previous studies focused on the qualitative description of ES interactions, however, there have been relatively few studies on spatially explicit and quantitative assessment of ES interactions. In this paper, we mapped the ecosystem service of soil conservation (SC), net primary production (NPP) and water yield (WY) in the upper reaches of Hanjiang River Basin (URHR) based on the land use and land cover (LULC), NDVI, soil properties and observed climate data covering 2000-2013. Moreover, we quantitatively assessed the variation characteristics of interactions among different ES with a spatio-temporal statistical framework by applying the partial correlation analysis at a pixel scale. The results are shown as follows: (1) From 2000 to 2013, the mean annual SC was 434.20 t·hm-2·yr-1, and the mean annual WY was 250.34 mm. They also presented a rising tendency at the rate of 16.10 t·hm-2·yr-1 and 3.79 mm·yr-1, respectively. However, the mean annual NPP was 854.11 gC·m-2·yr-1, and presented a decreasing tendency at the rate of 8.54 gC·m-2·yr-1. (2) Spatially, SC was high in the North-South mountain area, while it was low in the Middle valley region. Similarly, the NPP in the Middle valley region was lower than that of other regions. However, the WY increased from north to south. (3) The three pairwise ES presented different interactions. Both the interaction between SC and NPP and that between SC and WY presented as trade-off, accounting for 62.77% and 71.60% of the total area, respectively. On the contrary, the interaction between NPP and WY was prone to synergies, accounting for 62.89% of the total area. (4) Pairwise ES in different land cover types also presented a different interaction. As for woodland, wetland, cropland, artificial land and bare land, SC and NPP, as well as SC and WY both presented trade-off, while WY and NPP presented synergy. Specially, in grassland, all the three pairwise ES presented a trade-off relationship. Therefore, spatially explicit and quantitative assessment of ES interactions are more helpful for revealing the temporal non-linear evolution, and the spatial heterogeneity of ES interactions. This analysis framework also contributes to the regional sustainable land management and the optimization of multiple ES conservation. Trade-off analyses and synthetic integrated method of multiple ecosystem services. Resources Science, 2016, 38(1): 1-9. Li Yingjie, Zhang Liwei, Yan Junping, et al. Mapping the hotspots and coldspots of ecosystem services in conservation priority setting. Journal of Geographical Sciences, 2017, 27(6): 681-696. Peng Jian, Hu Xiaoxu, Zhao Mingyue, et al. Research progress on ecosystem service trade-offs: From cognition to decision-making. Acta Geographica Sinica, 2017, 72(6):960-973. Bennett E M, Peterson G D, Gordon L J. Understanding relationships among multiple ecosystem services. Ecology Letters, 2009, 12(12): 1394-1404. Abstract Ecology Letters (2009) 12: 1394 1404 Abstract Ecosystem management that attempts to maximize the production of one ecosystem service often results in substantial declines in the provision of other ecosystem services. For this reason, recent studies have called for increased attention to development of a theoretical understanding behind the relationships among ecosystem services. Here, we review the literature on ecosystem services and propose a typology of relationships between ecosystem services based on the role of drivers and the interactions between services. We use this typology to develop three propositions to help drive ecological science towards a better understanding of the relationships among multiple ecosystem services. Research which aims to understand the relationships among multiple ecosystem services and the mechanisms behind these relationships will improve our ability to sustainably manage landscapes to provide multiple ecosystem services. Li Shuangcheng, Zhang Caiyu, Liu Jinlong, et al. The tradeoffs and synergies of ecosystem services: Research progress, development trend, and themes of geography. Geographical Research, 2013, 32(8): 1379-1390. Li Yingjie, Zhang Liwei, Qiu Jiangxiao, et al. Spatially explicit quantification of the interactions among ecosystem services. Landscape Ecology, 2017, 32(6): 1181-1199. Li Peng, Jiang Luguang, Feng Zhiming, et al. Research progress on trade-offs and synergies of ecosystem services:an overview. Acta Ecologica Sinica, 2012, 32(16): 5219-5229. Ecological Indicators, 2016, 66: 340-351. Ecosystems provide multiple ecosystem services (ES) to society. Ignoring the multi-functionality of land systems in natural resource management generates potential trade-offs with respect to the provisioning of ES. Understanding relationships between ES can therefore help to minimize undesired trade-offs and enhance synergies. The research on relationships between ES has recently gained increasing attention in the scientific community. However, a synthesis on existing knowledge and knowledge gaps is missing so far. We analyzed 67 case studies that studied 476 pairwise ES combinations. The relationships between these pairs of ES were classified into three categories: “trade-off”, “synergy” or “no-effect”. We tested three hypotheses: (1) a dominant relationship between ES exists for each ES pair; (2) this relationship is influenced by the scale at which the relationship had been studied as well as by the land system the analysis took place; and (3), this relationship is further affected by the method applied to characterize the relationship. For the first hypothesis, we demonstrated a comprehensive matrix of pairs of ES. Most pairs of ES (74%) had a clear association with one category: the majority of case studies reported similar relationships for pairs of ES. A synergistic relationship was dominant between different regulating services and between different cultural services, whereas the relationship between regulating and provisioning services was trade-off dominated. Increases in cultural services did not influence provisioning services (“no-effect”). For the second hypothesis, our analysis showed that the overall pattern of ES relationships did not change significantly with scale and land system archetypes except for some ES pairs. The regional scale was the most commonly considered, and case studies were biased among different land system archetypes, which might affect our ability to find the effect of scale or land system archetypes on the pattern of relationships. The analysis for the third hypothesis showed that the choice of methods used to determine the relationship had an effect on the direction of the relationship: studies that employed correlation coefficients showed an increased probability to identify no-effect relationships, whereas descriptive methods had a higher probability of identifying trade-offs. Our results provide helpful information of which services to include in ES assessments for the scientific community as well as for practitioners. Furthermore, they allow a first check if critical trade-offs and synergies have been considered in an analysis. Hou Ying, Lü Yihe, Chen Wei, et al. Temporal variation and spatial scale dependency of ecosystem service interactions: a case study on the central Loess Plateau of China. Landscape Ecology, 2017, 32(6): 1201-1217. Dai Erfu, Wang Xiaoli, Zhu Jianjia, et al. Methods, tools and research framework of ecosystem service trade-offs. Geographical Research, 2016, 35(6): 1005-1016. Lautenbach S, Volk M, Gruber B, et al. Jia Xiaoqing, Fu Bojie, Feng Xiaoming, et al. The tradeoff and synergy between ecosystem services in the Grain-for-Green areas in Northern Shaanxi, China. Ecological Indicators, 2014, 43: 103-113. As an important part of the strategy of Western development, the Grain-for-Green Program (GFGP) was initiated to protect the environment and mitigate disasters. Ecosystem services and their dynamics are considered emerging features of ecological quality and the change in direction by many scholars and practitioners. Extending from ecosystem services (ESs) modeling, we propose a simple and feasible framework for quantitatively assessing the benefits and equilibrium of the consequences of the GFGP. Our starting evaluation shows that ESs has changed dramatically in the GFGP area. By fitting pair-wise ESs spatial concordances at the grid-cell level, we have revealed the tradeoffs between provisioning and regulating services and the synergies between the regulating services. The analysis of the variability of the relationship between ESs on different land cover types clearly identifies the vegetation that has produced exceptionally strong ESs. Our findings suggest that quantifying the interactions between ESs may improve the ecosystem-based management practices and support policy-making to address the challenges of the sustainable use of natural resources. The framework designed for regional-scale analysis can help in clearly understanding the interrelations of ESs and make natural resources related decisions more effective and efficient, although this framework still needs to move beyond these fundamental and illustrative analyses to more fully explain the synergies and tradeoffs. Lu Nan, Fu Bojie, Jin Tiantian, et al. Trade-off analyses of multiple ecosystem services by plantations along a precipitation gradient across Loess Plateau landscapes. Landscape Ecology, 2014, 29(10): 1697-1708. Tian Yichao, Wang Shijie, Bai Xiaoyong, et al.
. Science of The Total Environment, 2016, 566-567: 1297-1308. 61We developed an integrated model to quantify ecosystem services by coupling CASA and SWAT.61Cultivated field shrinkage, pasture and forest land expansion were observed during 2000–2010.61The sediment and water yields exhibited a decreasing trend, whereas NPP was reversely varied.61We assessed the synergies and trade-offs relationships among ecosystem services.61The area of afforestation should be based on runoff and soil erosion instead of pursuing the forest coverage rate blindly. Yang Xiaonan, Zhou Zixiang, Li Jing, et al. Trade-offs between carbon sequestration, soil retention and water yield in the Guanzhong-Tianshui Economic Region of China. Journal of Geographical Sciences, 2016, 26(10): 1449-1462. Natural ecosystems provide human society with very important products and services. With the rapid increase in population and the over-exploitation of natural resources, humans are continually enhancing the production of some services at the expense of others. This paper estimates changes in ecosystem services, and the relationship between these services in the Guanzhong-Tianshui Economic Region of China. These ecosystem changes are of great significance to the sustainable development of this economic region. The concept of production possibility frontier (PPF) is applied to evaluate the trade-offs and synergy between carbon sequestration, water yield and soil retention. Three land use strategy scenarios lanning, exploitation and protection re applied to evaluate potential changes in ecosystem services. This study reveals noticeable trade-offs between carbon sequestration, soil retention and water yield, with synergy between carbon sequestration and soil retention. There are synergies between carbon sequestration, water yield and soil retention in the three scenarios. The protection scenario is the most favourable land use strategy for regulating ecosystem service capacity. This scenario results in the highest carbon sequestration, water yield and soil retention. The results could have implications for natural capital and ecosystem services planning, management and land use decision-making. Cao Qiwen, Wei Xiaomei, Wu Jiansheng. A review on the tradeoffs and synergies among ecosystem services. Chinese Journal of Ecology, 2016, 35(11): 3102-3111. Gonzalez-Redin J, Luque S, Poggio L, et al.
. Environmental Research, 2016, 144, Part B: 15-26. Haase D, Schwarz N, Strohbach M, et al. Synergies, trade-offs, and losses of ecosystem services in urban regions: An integrated multiscale framework applied to the Leipzig-Halle Region, Germany. Ecology and Society, 2012, 17(3): 22. Because we have entered the #039;millennium of the cities#039;, urban ecological research needs to account for the provisions ecosystem services provide to urban regions. In urban areas, ecosystem service assessment studies need to account for the complex land use patterns, which change over relatively short periods of time. We discuss an analytical framework for the spatial and temporal integration of different ecosystem services in an urban region to determine synergies, trade-offs and losses, and we employ a case study in Leipzig-Halle, Germany. The following five ecosystem services, which are of special importance for urban areas, were selected: local climate regulation, recreation potential, biodiversity potential, food supply, and above-ground carbon storage. These services were analyzed from 1990 to 2006. Our results identified only slight increases in urbanization (1% or 3 km ) and in mining restoration (-11 km ). However, the detected land use changes led to synergies with biodiversity and climate regulation of gt; 50% of the total area, whereas trade-offs of approximately 60% were detected between variables such as climate regulation and recreation. Finally, we address both the opportunities and the challenges that were encountered in the integration study, specifically with respect to the application in land use planning. Sharps K, Masante D, Thomas A, et al.
. Science of the Total Environment, 2017, 584/585: 118-130. Ecosystem services modelling tools can help land managers and policy makers evaluate the impacts of alternative management options or changes in land use on the delivery of ecosystem services. As the variety and complexity of these tools increases, there is a need for comparative studies across a range of settings, allowing users to make an informed choice. Using examples of provisioning and regulating services (water supply, carbon storage and nutrient retention), we compare three spatially explicit tools LUCI (Land Utilisation and Capability Indicator), ARIES (Artificial Intelligence for Ecosystem Services) and InVEST (Integrated Valuation of Ecosystem Services and Tradeoffs). Models were parameterised for the UK and applied to a temperate catchment with widely varying land use in North Wales. Although each tool provides quantitative mapped output, can be applied in different contexts, and can work at local or national scale, they differ in the approaches taken and underlying assumptions made. In this study, we focus on the wide range of outputs produced for each service and discuss the differences between each modelling tool. Model outputs were validated using empirical data for river flow, carbon and nutrient levels within the catchment. The sensitivity of the models to land-use change was tested using four scenarios of varying severity, evaluating the conversion of grassland habitat to woodland (0 30% of the landscape). We show that, while the modelling tools provide broadly comparable quantitative outputs, each has its own unique features and strengths. Therefore the choice of tool depends on the study question. Nelson E, Mendoza G, Regetz J, et al. Modeling multiple ecosystem services, biodiversity conservation, commodity production, and tradeoffs at landscape scales. Frontiers in Ecology and the Environment, 2009, 7(1): 4-11. Thompson J R, Lambert K F, Foster D R, et al. The consequences of four land-use scenarios for forest ecosystems and the services they provide. Abstract Anticipating landscape- to regional-scale impacts of land use on ecosystems and the services they provide is a central challenge for scientists, policymakers, and resource managers. Working with a panel of practitioners and regional experts, we developed and analyzed four plausible but divergent land-use scenarios that depict the future of Massachusetts from 2010 to 2060 to address two questions: (1) ow do the magnitude and spatial distribution of ecosystem service provisioning vary under the different land-use regimes? and (2) hat are the synergies and trade-offs among direct human uses, ecosystem services, and habitat quality? Each scenario specifies the detailed prescriptions for the major uses of the forests, including conversion to residential and commercial development, clearing new farmland, shifting silvicultural practices, and designating forests protected from development. We simulated the land-use scenarios and their interactions with anticipated climate change by coupling statistical models of land use to the LANDIS-II landscape model and then evaluated the outcomes in terms of the magnitude and spatial distribution of (1) direct human uses of the landscape (residential and commercial development, agricultural, timber harvest), (2) ecosystem services (carbon storage, flood regulation, nutrient retention), and (3) habitat quality (forest tree species composition, interior forest habitat). Across all scenarios, conflicts occurred between dispersed residential development and the supply of ecosystem services and habitat quality. In all but the scenario that envisioned a significant agricultural expansion, forest growth resulted in net increases in aboveground carbon storage, despite the concomitant forest clearing and harvesting. One scenario, called Forests as Infrastructure, showed the potential for synergies between increased forest harvest volume through the sustainable practices that encouraged the maintenance of economically and ecologically important tree species, and carbon storage. This scenario also showed trade-offs between development density and water quantity and quality at the watershed scale. The process of integrated scenario analysis led to important insights for land managers and policymakers in a populated forested region where there are tensions among development, forest harvesting, and land conservation. More broadly, the results emphasize the need to consider the consequences of contrasting land-use regimes that result from the interactions between human decisions and spatially heterogeneous landscape dynamics. Fu Bojie, Zhang Liwei, Xu Zhihong, et al. Ecosystem services in changing land use. Journal of Soils and Sediments, 2015, 15(4): 833-843. Mina M, Bugmann H, Cordonnier T, et al. Future ecosystem services from European mountain forests under climate change. Journal of Applied Ecology, 2017, 54(2): 389-401. Abstract Ecosystem services (ES) from mountain forests are highly relevant for human societies. ES with a direct economic support function (e.g. timber production), regulatory services (e.g. protection from natural hazards) and cultural services (e.g. recreation) are likely to be affected strongly by a rapidly changing climate. To evaluate whether adverse climate change effects on ES can be counteracted by adapting management, dynamic models and indicator-based assessments are needed. 2.We applied a forest dynamic model in case study areas of four European mountain regions and evaluated the future supply of four ES - timber production, carbon sequestration, biodiversity, and protection against natural hazards - using state-of-the-art ES indicators. Forest dynamics were simulated under three management scenarios (no management, business-as-usual, and alternative management) and five climate change projections for selected representative stand types in each region. We analysed potential trade-offs and synergies between ES, and evaluated future changes among regions, forest stands, climate and management scenarios. 3.Impacts of climate change on the provision of multiple ES were found to be highly heterogeneous and to depend on the region, site, and future climate. In the absence of large-scale natural disturbance (not considered), protection services, carbon stock and deadwood abundance (proxy for biodiversity) benefitted from no management in all regions. Negative impacts of climate change were evident for the provision of multiple ES but limited to the most severe climate scenarios and low-elevation stands. Synergies and trade-offs between the majority of ES were found to be sensitive to the choice of management strategy and in some regions to climate change. 4.Synthesis and applications. Management regimes in European mountain forests should be regionally adapted to stand and site conditions. Although in some cases alternative management regimes may be more suitable than current management for supporting multiple ecosystem services, adaptation options should be evaluated carefully at the local scale due to the highly different magnitude of the impacts of climate change in different regions and along elevation gradients. This article is protected by copyright. All rights reserved. Tomscha S A, Gergel S E.
Ecosystem service trade-offs and synergies misunderstood without landscape history. Ecology and Society, 2016, 21(1): 43. Dramatic changes in ecosystem services have motivated recent work characterizing their interactions, including identifying trade-offs and synergies. Although time is arguably implicit in these ideas of trade-offs and synergies (e.g., temporal dynamics or changes in ecosystem services), such interactions are routinely inferred based on the spatial relationships among ecosystem services alone (e.g., spatial concordance of ecosystem services indicates synergies, whereas incongruence signifies trade-offs). The limitations of this approach have not been fully explored. We quantified ecosystem service interactions using correlations among contemporary ecosystem services and compared these results to those derived by incorporating change in ecosystem services from an earlier decade. To document change over ~60 years in an urbanizing floodplain, we used aerial photography to map multiple floodplain-associated ecosystem services. Our results demonstrate how incorporating landscape baselines can influence measured synergies and trade-offs. Spatial correlations among contemporary ecosystem services missed several interactions that were detected when using prior baseline ecosystem services. Ignoring the history of ecosystem services and their change over time may result in missed opportunities to foster their synergies and lead to unnecessary trade-offs. Efforts to incorporate ecosystem services into land management should include long-term monitoring and baseline reconstructions of ecosystem services. Wang Jiwei, Sun Guang, Luo Zunlan, et al. Soil conservation service function of Hanjiang River upstream forest ecosystems. Environmental Science & Technology, 2015, 38(12): 291-297. Liu Xianfeng, Zhu Xiufang, Pan Yaozhong, et al. Vegetation dynamics in Qinling-Daba Mountains in relation to climate factors between 2000 and 2014. Journal of Geographical Sciences, 2016, 26(1): 45-58. Mao Peini, Pang Jiangli, Huang Chunchang, et al. Chemical weathering characteristics and regional comparative study of the loess deposits in the upper Hanjiang River. Acta Geographica Sinica, 2017, 72(2): 279-291. Wang Jianglei, Lü Yihe, Zeng Yuan, et al. Spatial heterogeneous response of land use and landscape functions to ecological restoration: The case of the Chinese loess hilly region. Environmental Earth Sciences, 2014, 72(7): 2683-2696. Ecological restorations over time may have profound effects on ecological and socio-economic systems. However, land-use changes and landscape functions that accompany ecological restorations can have spatial differentiations due to varied biophysical and socio-economic contexts. Therefore, these spatial differentiations caused by ecological restoration must be understood for better planning and management of restoration activities. The Baota District, with 576 villages in the center of the Chinese Loess Plateau, was selected as the study area because of its dramatic transition from cropland to grassland and shrubland from 1990 to 2010. Using the ArcGIS software and a k -means clustering analysis, an approach to identify types of land-use change patterns (TLCPs) at the village level was developed, and four TLCPs were delineated. The analysis indicated a general pattern of cropland decline by 21.6%, but revealed significant spatial variations between villages in different TLCPs. Vegetation cover and soil retention, which are key proxies for landscape functions, increased by 22.70 and 108%, respectively, from 2000 to 2010 with significant spatial heterogeneity. The Universal Soil Loss Equation was employed for the assessment of soil retention. The analysis of landscape metrics revealed a major trend of fragmentation and regularity on the county and village scale; however, spatial variations remained. Physical attributes were used to characterize different TLCPs, and notable differences were found. The spatial heterogeneous change in land use and landscape functions on the village scale may be useful for land use and ecological restoration management policy makers. Zhang Lei, Wu Bingfang, Li Xiaosong, et al. Classification system of China land cover for carbon budget. Acta Ecologica Sinica, 2014, 34(24): 7158-7166. Wischmeier W H, Smith D D.
Predicting rainfall-erosion losses from cropland east of the rocky mountains-guide for selection of practices for soil and water conservation. Washington: US Department of Agriculture, 1965. Sharpley A N, Williams J R.
. Technical Bulletin-United States Department of Agriculture, 1990, 1768: 3-9. Zhang Liwei, Fu Bojie, Lü Yihe, et al. Balancing multiple ecosystem services in conservation priority setting. Landscape Ecology, 2015, 30(3): 535-546. Conservation priority setting is the critical process of allocating the limited resources available for nature conservation and; safeguarding the sustainability of biodiversity and ecosystem services (ESs). It is difficult, however, to achieve the goal of simultaneously conserving both biodiversity and ESs, not only because of the potential trade-offs between biodiversity and ESs, but also because of the trade-offs between multiple ESs. Thus far, research has focused on the trade-offs between ESs caused by spatial competition resulting from land use change or by the destruction of biophysical interaction between multiple ESs. Few studies, however, have paid attention to the trade-offs induced during the decision-making process. Approaches for measuring the trade-offs between multiple ESs in decision-making processes would thus prove to be extremely helpful. 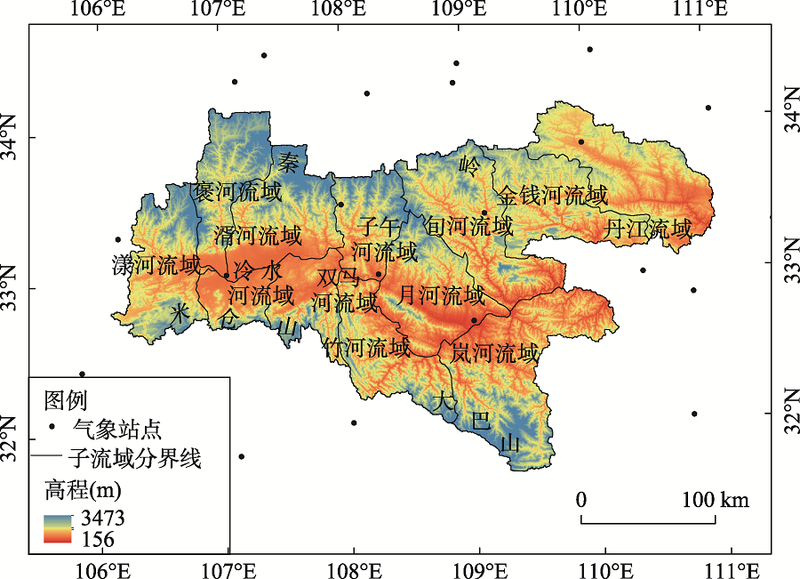 In this paper, we map the water supply, soil conservation, and net primary production as ESs in the Jiangxi province of China in the year 2010, and use risk, tradeoff, and spatial efficiency indices to measure the conservation efficiency of seven established ordered weighted averaging (OWA) scenarios under two conservation levels (conserving the top ESs at 10 or 20 % of the area of the Jiangxi province). The main results are as follows: (1) conserving one ES may result in inefficient conservation of other ESs; and (2) conserving multiple ESs and the use of GIS-based OWA methods can balance conflicts among multiple ESs and can significantly enhance the spatial efficiency of the identified priority areas. Decision-makers may combine the spatial efficiency, risk and tradeoff levels of each OWA scenario with other specific conservation demands of their own specific cases in order to achieve the optimal identification of priority areas for the simultaneous conservation of multiple ESs. Wang Jitao, Peng Jian, Zhao Mingyue, et al. Significant trade-off for the impact of Grain-for-Green Programme on ecosystem services in north-western Yunnan, China. Science of The Total Environment, 2017, 574: 57-64. Abstract Ecological restoration can mitigate human disturbance to the natural environment and restore ecosystem functions. China's Grain-for-Green Programme (GFGP) has been widely adopted in the last 15years and exerted significant impact on land-use and ecosystem services. North-western Yunnan is one of the key areas of GFGP implementation in the upper Yangtze River. Promotion of ecosystem services in this region is of great importance to the ecological sustainability of Yangtze River watershed. In this study, remote sensing and modelling techniques are applied to analyse the impact of GFGP on ecosystem services. Results show that the transformation from non-irrigated farmland to forestland could potentially improve soil conservation by 24.89%. Soil conservation of restored forest was 78.17% of retained forest while net primary production (NPP) already reached 88.65%, which suggested different recovery rates of NPP and soil conservation. Increasing extent of GFGP implementation improved soil conservation but decreased NPP and water yield at sub-watershed scale, which revealed trade-offs between ecosystem services under ecological restoration. Future ecosystem management and GFGP policy-making should consider trade-offs of ecosystem services in order to achieve sustainable provision of ecosystem services. Copyright 2016 Elsevier B.V. All rights reserved. Lufafa A, Tenywa M, Isabirye M, et al. Prediction of soil erosion in a Lake Victoria basin catchment using a GIS-based Universal Soil Loss model. Agricultural systems, 2003, 76(3): 883-894. Soil erosion patterns in watersheds are patchy, heterogeneous and therefore difficult to assess. The problem can be overcome by using predictive models. However, wide spread soil erosion model-factor parameterization and quantification is difficult due to the costs, labor and time involved. The objective of this study was to evaluate different methods of USLE input parameter derivation and to predict soil loss within a microcatchment of the Lake Victoria basin (LVB). The highest soil loss was predicted for annual cropland use (93 t ha 611 year 611 ), followed by rangeland (52 t ha 611 year 611 ), banana–coffee (47 t ha 611 year 611 ), banana (32 t ha 611 year 611 ) and forest and papyrus swamp. In the terrain units, soil loss was highest within the back slopes (48 t ha 611 year 611 ) followed by the summits (42 t ha 611 year 611 ) and valleys (0 t ha 611 year 611 ). For the soil units, soil loss was highest in the Chromic Luvisols (52 t ha 611 year 611 ) followed by Petroferric Luvisols (37 t ha 611 year 611 ), Mollic Gleysols (5 t ha 611 year 611 ) Dystric Planasols (0 t ha 611 year 611 ) in large part because soil classification often correspond to various slope position. Fu Bojie, Liu Yu, Lü Yihe, et al. Assessing the soil erosion control service of ecosystems change in the Loess Plateau of China. Ecological Complexity, 2011, 8(4): 284-293. Soil erosion in terrestrial ecosystems, as an important global environmental problem, significantly impacts on environmental quality and social economy. By protecting soil from wind and water erosion, terrestrial ecosystems supply human beings with soil erosion control service, one of the fundamental ecosystem services that ensure human welfare. The Loess Plateau was one of the regions in the world that suffered from severe soil erosion. In the past decades, restoration projects were implemented to improve soil erosion control in the region. The Grain-to-Green project, converting slope croplands into forest or grasslands, launched in 1999 was the most massive one. It is needed to assess the change of soil erosion control service brought about by the project. This study evaluated the land cover changes from 2000 to 2008 by satellite image interpretation. Universal Soil Loss Equation (USLE) was employed for the soil erosion control assessment for the same period with localized parameters. Soil retention calculated as potential soil erosion (erosion without vegetation cover) minus actual soil erosion was applied as indicator for soil erosion control service. The results indicate that ecosystem soil erosion control service has been improved from 2000 to 2008 as a result of vegetation restoration. Average soil retention rate (the ratio of soil retention to potential soil loss in percentage) was up to 63.3% during 2000–2008. Soil loss rate in 34% of the entire plateau decreased, 48% unchanged and 18% slightly increased. Areas suffering from intense erosion shrank and light erosion areas expanded. Zones with slope gradient of 8°–35° were the main contribution area of soil loss. On average, these zones produced 82% of the total soil loss with 45.5% of the total area in the Loess Plateau. Correspondingly, soil erosion control capacity was significantly improved in these zones. Soil loss rate decreased from 5000 t km 612 yr 611 to 3600 t km 612 yr 611, 6900 t km 612 yr 611 to 4700 t km 612 yr 611, and 8500 t km 612 yr 611 to 5500 t km 612 yr 611 in the zones with slope gradient of 8°–15°, 15°–25°, and 25°–35° respectively. However, the mean soil erosion rate in areas with slope gradient over 8° was still larger than 3600 t km 612 yr 611, which is far beyond the tolerable erosion rate of 1000 t km 612 yr 611. Thus, soil erosion is still one of the top environmental problems that need more ecological restoration efforts. Feng Xiaoming, Sun Ge, Fu Bojie, et al. Regional effects of vegetation restoration on water yield across the Loess Plateau, China. Hydrology and Earth System Sciences, 2012, 16(8): 2617-2628. Sun Ge, Zhou Guoyi, Zhang Zhiqiang, et al. Potential water yield reduction due to forestation across China. Journal of Hydrology, 2006, 328(3/4): 548-558. It is widely recognized that vegetation restoration will have positive effects on watershed health by reducing soil erosion and non-point source pollution, enhancing terrestrial and aquatic habitat, and increasing ecosystem carbon sequestration. However, the hydrologic consequences of forestation on degraded lands are not well studied in the forest hydrology community as a whole. China has the largest area of forest plantations in the world now, and the hydrologic consequences of massive forestation are unknown. We applied a simplified hydrological model across the diverse physiographic region to estimate the potential magnitude of annual water yield response to forestation. Our study suggests that the average water yield reduction may vary from about 50 mm/yr (50%) in the semi-arid Loess Plateau region in northern China to about 300 mm/yr (30%) in the tropical southern region. We conclude that forestation in China that often involves a combination of tree planting and engineering (e.g., terracing) may have even a higher potential to greatly reduce annual water yield in headwater watersheds, especially in the semi-arid Loess Plateau region. However, the forestation area is relatively small for most large basins with mixed landuses in China, thus the regional effects of forestation on water resource management may not be of major concern. Comprehensive science-based evaluation of roles of forests on regulating regional water resources is critical to the current forestation endeavors in China. Lu Nan, Sun Ge, Feng Xiaoming, et al. Water yield responses to climate change and variability across the North-South Transect of Eastern China (NSTEC). Journal of Hydrology, 2013, 481: 96-105. China is facing a growing water crisis due to climate and land use change, and rise in human water demand across this rapidly developing country. Understanding the spatial and temporal ecohydrologic responses to climate change is critical to sustainable water resource management. We investigated water yield (WY) responses to historical (1981–2000) and projected potential climate changes across a large and complex climatic and land cover gradients over the North–South Transect of Eastern China (NSTEC, a standard terrestrial transect of the International GeoBiological Project, IGBP). After an annual scale evapotranspiration (ET) model was validated with historical streamflow records from ten watersheds, the model was applied to the NSTEC that encompasses seven climatic zones. We found that (1) The spatial and temporal variations of WY were highly dependent on precipitation ( P ) patterns during 1981–2000. Overall, the influences of significant temperature ( T ) rise on the trend of WY were suppressed by the insignificant P change during 1981–2000. (2) The long-term mean WY by climatic zone had a similar pattern as P . The different climatic zones had differential contributions to the total volumetric WY of the NSTEC. Within each climatic zone, the volumetric WY for each land cover type was highly dependent on its area of each land cover. (3) Corresponding to the P pattern, the mean WY decreased from the low (South) to high latitude (North), but the rates of changes varied along the NSTEC. Along the NSTEC, the sensitivity of WY to potential T and P changes increased from the high latitude to the low latitude. Future potential changes in WY are likely to follow changes in P with some modification by changes in energy availability. We conclude that precipitation is a major driver for water resource availability, and reliable prediction of future precipitation change patterns is critical to hydrologic forecast across the study region. Zhang Mingfang, Wei Xiaohua, Sun Pengsen, et al.
. Journal of Hydrology, 2012, 464/465: 1-11. Forest disturbance (or land cover change) and climatic variability are commonly recognized as two major drivers interactively influencing hydrology in forested watersheds. However, separating their relative contributions to hydrology is rarely examined, particularly in large watersheds (>100002km 2 ). This study used a large watershed, the Upper Zagunao River watershed, situated in the upper reach of the Minjiang River, the Yangtze River basin, China as an example to demonstrate how the effects of forest harvesting and climatic variability on hydrology can be quantitatively separated. Long-term data on climate, hydrology and forest harvesting history are available from1953 to 1996. Time series cross-correlation analysis and non-parametric tests were performed first to identify possible responses of annual and seasonal runoff to forest harvesting, and to determine breakpoints of runoff change over its long-term time series. Then, modified double mass curve of accumulated annual effective precipitation (the residual of precipitation and evapotranspiration) and accumulated annual runoff was used to quantify the relative contributions of forest harvesting and climatic variability to annual runoff variation. Our analysis showed that the breakpoint of significant annual runoff change occurred in1969, about 1002yrs after the intensive harvesting period of 1955–1962, suggesting the delayed hydrological response in the studied large watershed. Over the period of 1970–1996, the average annual runoff increment attributed to forest harvesting was 3802mm/yr, while the annual runoff variation attributed to climatic variability was 6138.302mm/yr, clearly demonstrating that forest harvesting and climatic variability had offsetting effects on annual runoff. Our results also disclosed that the positive effect of forest harvesting on runoff decreased with forest recovery and eventually diminished about 2002yrs after intensive harvesting period. Computation of direct runoff amounts from storm rainfall. Dijon: International Association of Scientific Hydrology Publication, 1963. Zhang L, Dawes W R, Walker G R.
Response of mean annual evapotranspiration to vegetation changes at catchment scale. Water Resources Research, 2001, 37(3): 701-708. Zhao Yang, Yu Xinxiao, Zheng Jiangkun, et al. Quantitative effects of climate variations and land-use changes on annual streamflow in Chaobai River basin. Transactions of the Chinese Society of Agricultural Engineering, 2012, 28(22): 252-260. Sun G, McNulty S G, Lu J, et al. Regional annual water yield from forest lands and its response to potential deforestation across the southeastern United States. Journal of Hydrology, 2005, 308(1): 258-268. Regional water yield at a meso-scale can be estimated as the difference between precipitation input and evapotranspiration output. Forest water yield from the southeastern US varies greatly both in space and time. Because of the hot climate and high evapotranspiration, less than half of the annual precipitation that falls on forest lands is available for stream flow in this water-rich region. Water yield is highest in the mountainous regions that receive the highest precipitation and have the lowest air temperature, and the lowest in the coastal regions that are dominated by wetlands receiving moderate rainfall but high evapotranspiration. Water resource management for both floods and droughts demands an accurate estimation of water yield from forests. Projected climate and land use changes further increase the variability of water yield in the region. The objectives of this study were to (1) develop a simple annual water yield modeling procedure by testing and calibrating a generalized global evapotranspiration model, (2) to apply the validated model to estimate regional forest water yield and to predict potential water yield response to forest removal. Hydrologic databases at a watershed-scale and a regional-scale were developed for model development, calibration, and validation. We applied the water yield model to the southern region by integrating land cover and high resolution climate databases by using a Geographic Information System (GIS). The model developed in this paper can be used to examine the spatial and temporal variability for water yield and predict the effects of climate and land cover changes at the regional scale. Terrestrial ecosystem production: A process model based on global satellite and surface data. Global Biogeochem Cycle, 1993, 7(4): 811-841. This paper presents a modeling approach aimed at seasonal resolution of global climatic and edaphic controls on patterns of terrestrial ecosystem production and soil microbial respiration. We use satellite imagery (Advanced Very High Resolution Radiometer and International Satellite Cloud Climatology Project solar radiation), along with historical climate (monthly temperature and precipitation) and soil attributes (texture, C and N contents) from global (1°) data sets as model inputs. The Carnegie-Ames-Stanford approach (CASA) Biosphere model runs on a monthly time interval to simulate seasonal patterns in net plant carbon fixation, biomass and nutrient allocation, litterfall, soil nitrogen mineralization, and microbial COproduction. The model estimate of global terrestrial net primary production is 48 Pg C yrwith a maximum light use efficiency of 0.39 g C MJPAR. Over 70% of terrestrial net production takes place between 30°N and 30°S latitude. Steady state pools of standing litter represent global storage of around 174 Pg C (94 and 80 Pg C in nonwoody and woody pools, respectively), whereas the pool of soil C in the top 0.3 m that is turning over on decadal time scales comprises 300 Pg C. Seasonal variations in atmospheric COconcentrations from three stations in the Geophysical Monitoring for Climate Change Flask Sampling Network correlate significantly with estimated net ecosystem production values averaged over 50°-80° N, 10°-30° N, and 0°-10° N.
 Zhang Yili, Qi Wei, Zhou Caiping, et al. Spatial and temporal variability in the net primary production of alpine grassland on the Tibetan Plateau since 1982. Journal of Geographical Sciences, 2014, 24(2): 269-287. Based on the GIMMS AVHRR NDVI data (8 km spatial resolution) for 1982–2000, the SPOT VEGETATION NDVI data (1 km spatial resolution) for 1998–2009, and observational plant biomass data, the CASA model was used to model changes in alpine grassland net primary production (NPP) on the Tibetan Plateau (TP). This study will help to evaluate the health conditions of the alpine grassland ecosystem, and is of great importance to the promotion of sustainable development of plateau pasture and to the understanding of the function of the national ecological security shelter on the TP. The spatio-temporal characteristics of NPP change were investigated using spatial statistical analysis, separately on the basis of physico-geographical factors (natural zone, altitude, latitude and longitude), river basin, and county-level administrative area. Data processing was carried out using an ENVI 4.8 platform, while an ArcGIS 9.3 and ANUSPLIN platform was used to conduct the spatial analysis and mapping. The primary results are as follows: (1) The NPP of alpine grassland on the TP gradually decreases from the southeast to the northwest, which corresponds to gradients in precipitation and temperature. From 1982 to 2009, the average annual total NPP in the TP alpine grassland was 177.2×10 12 gC yr 611 (yr represents year), while the average annual NPP was 120.8 gC m 612 yr 611 . (2) The annual NPP in alpine grassland on the TP fluctuates from year to year but shows an overall positive trend ranging from 114.7 gC m 612 yr 611 in 1982 to 129.9 gC m 612 yr 611 in 2009, with an overall increase of 13.3%; 32.56% of the total alpine grassland on the TP showed a significant increase in NPP, while only 5.55% showed a significant decrease over this 28-year period. (3) Spatio-temporal characteristics are an important control on annual NPP in alpine grassland: a) NPP increased in most of the natural zones on the TP, only showing a slight decrease in the Ngari montane desert-steppe and desert zone. The positive trend in NPP in the high-cold shrub-meadow zone, high-cold meadow steppe zone and high-cold steppe zone is more significant than that of the high-cold desert zone; b) with increasing altitude, the percentage area with a positive trend in annual NPP follows a trend of “increasing-stable-decreasing”, while the percentage area with a negative trend in annual NPP follows a trend of “decreasing-stable-increasing”, with increasing altitude; c) the variation in annual NPP with latitude and longitude co-varies with the vegetation distribution; d) the variation in annual NPP within the major river basins has a generally positive trend, of which the growth in NPP in the Yellow River Basin is most significant. Results show that, based on changes in NPP trends, vegetation coverage and phonological phenomenon with time, NPP has been declining in certain places successively, while the overall health of the alpine grassland on the TP is improving. Zhu Wenquan, Pan Yaozhong, He Hao, et al. Simulation of maximum light use efficiency for some typical vegetation types in China. Chinese Science Bulletin, 2006, 51(4): 457-463. Maximum light use efficiency (εmax) is a key parameter for the estimation of net primary productivity (NPP) derived from remote sensing data. There are still many divergences about its value for each vegetation type. The εmax for some typical vegetation types in China is simulated using a modified least squares function based on NOAA/AVHRR remote sensing data and field-observed NPP data. The vegetation classification accuracy is introduced to the process. The sensitivity analysis of εmax to vegetation classification accuracy is also conducted. The results show that the simulated values of εmax are greater than the value used in CASA model, and less than the values simulated with BIOME-BGC model. This is consistent with some other studies. The relative error of εmax resulting from classification accuracy is -5.5%―8.0%. This indicates that the simulated values of εmax are reliable and stable. The using of composite indicators to assess the conservational effectiveness of ecosystem services in China. Acta Geographica Sinica, 2016, 71(5): 768-780. Xu Jianhua.Mathematical Methods in Contemporary Geography. 2nd ed. Beijing: Higher Education Press, 2002. Sun Yijie, Ren Zhiyuan, Zhao Shengnan, et al. 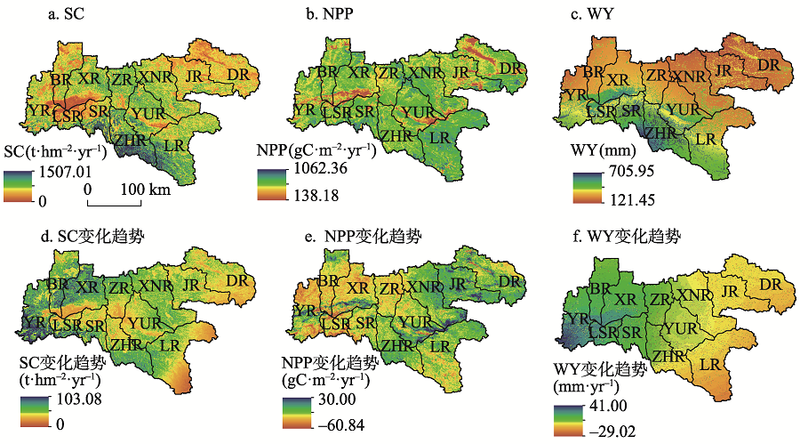 Spatial and temporal changing analysis of synergy and trade-off between ecosystem services in valley basins of Shaanxi Province. Acta Geographica Sinica, 2017, 72(3): 104-109. Renard D, Rhemtulla J M, Bennett E M.
Historical dynamics in ecosystem service bundles. Proceedings of the National Academy of Sciences, 2015, 112(43): 13411-13416. Managing multiple ecosystem services (ES), including addressing trade-offs between services and preventing ecological surprises, is among the most pressing areas for sustainability research. These challenges require ES research to go beyond the currently common approach of snapshot studies limited to one or two services at a single point in time. We used a spatiotemporal approach to examine changes in nine ES and their relationships from 1971 to 2006 across 131 municipalities in a mixed-use landscape in Quebec, Canada. We show how an approach that incorporates time and space can improve our understanding of ES dynamics. We found an increase in the provision of most services through time; however, provision of ES was not uniformly enhanced at all locations. Instead, each municipality specialized in providing a bundle (set of positively correlated ES) dominated by just a few services. The trajectory of bundle formation was related to changes in agricultural policy and global trends; local biophysical and socioeconomic characteristics explained the bundles' increasing spatial clustering. Relationships between services varied through time, with some provisioning and cultural services shifting from a trade-off or no relationship in 1971 to an apparent synergistic relationship by 2006. By implementing a spatiotemporal perspective on multiple services, we provide clear evidence of the dynamic nature of ES interactions and contribute to identifying processes and drivers behind these changing relationships. Our study raises questions about using snapshots of ES provision at a single point in time to build our understanding of ES relationships in complex and dynamic social-ecological systems. Wu Junxi, Zhao Yan, Yu Chengqun, et al. Land management influences trade-offs and the total supply of ecosystem services in alpine grassland in Tibet, China. Journal of Environmental Management, 2017, 193: 70-78. 61Grassland managements varied the trade-offs between ecosystem services.61Plowing and sowing converted the trade-off relationships into synergies immediately.61Grazing exclusion reduced the level of trade-offs gradually over time.61Variation in trade-offs relationships is because the varied dry matter allocation.61Another cause is the varied mechanism of species competition. Lester S E, Costello C, Halpern B S, et al. Evaluating tradeoffs among ecosystem services to inform marine spatial planning. Marine Policy, 2013, 38: 80-89. A central challenge for natural resource management is developing rigorous yet practical approaches for balancing the costs and benefits of diverse human uses of ecosystems. Economic theory has a long history of evaluating tradeoffs in returns from different assets to identify optimal investment strategies. There has been recent progress applying this framework to the delivery of ecosystem services in land use planning. However, despite growing national and international interest in marine spatial planning, there is a lack of parallel frameworks in the marine realm. This paper reviews an ecosystem service tradeoff analysis framework and provides a more comprehensive synthesis for how it can be applied to marine spatial planning and marine ecosystem-based management. A tradeoff analysis approach can reveal inferior management options, demonstrate the benefits of comprehensive planning for multiple, interacting services over managing single services, and identify 'compatible' services that provide win-win management options. (C) 2012 Elsevier Ltd. All rights reserved. Hao Ruifang, Yu Deyong, Wu Jianguo. Ecosystems & Environment, 2017, 240:171-181. Understanding the relationships between ecosystem services is important for promoting ecosystem service management and sustainable development. The relationships between ecosystem services have commonly been characterized as tradeoffs and synergies. Here, we report that a third type of relationship also exists, in which one ecosystem service constrains the other. Selecting the grassland and agro-pastoral transitional zone of North China (GAPTZ) as the study area, we examined the relationships between paired ecosystem services: net primary productivity (NPP), soil conservation (SC), soil erosion by wind (SL), water yield (WY), and water retention (WR). The constraint effect of one ecosystem service on the other was determined by extracting the upper constraint lines from the scatter plots of the paired ecosystem services with segmented quantile regression on the levels of landscape, class, and ecoregion. Our results revealed eight types of constraint effects between the ten paired ecosystem services: (1) positive linear, (2) negative linear, (3) logarithmic, (4) negative convex, (5) backward S-shaped, (6) hump-shaped, (7) convex-waved, and (8) concave-waved. At the landscape, class, and ecoregion levels, there was a hump-shaped constraint effect between NPP and SC. Precipitation was the main factor shaping the constraint line of the paired NPP-SC. The gradually increasing constraint effect of higher NPP on WY indicated that, in arid and semiarid areas, improving NPP decreases water yield. In farmland areas, the backward S-shaped constraint line of the paired NPP-SL indicates that crops, unlike forests and grasslands, could not protect soil from wind erosion. The constraint effects of SL on WY and WR are negative convex on the landscape level and convex-waved or concave-waved on the class and ecoregion levels. The constraint line approach enriches the understanding of linkages between ecosystem services and the potential drivers. The constraint effects of ecosystem services have important implications for sustainable land use planning to optimize landscapes services. Dallimer M, Davies Z G, Diaz-Porras D F, et al. Historical influences on the current provision of multiple ecosystem services. Global Environmental Change, 2015, 31: 307-317. Ecosystem service provision varies temporally in response to natural and human-induced factors, yet research in this field is dominated by analyses that ignore the time-lags and feedbacks that occur within socio-ecological systems. The implications of this have been unstudied, but are central to understanding how service delivery will alter due to future land-use/cover change. Urban areas are expanding faster than any other land-use, making cities ideal study systems for examining such legacy effects. We assess the extent to which present-day provision of a suite of eight ecosystem services, quantified using field-gathered data, is explained by current and historical (stretching back 150 years) landcover. Five services (above-ground carbon density, recreational use, bird species richness, bird density, and a metric of recreation experience quality ( continuity with the past ) were more strongly determined by past landcover. Time-lags ranged from 20 (bird species richness and density) to over 100 years (above-ground carbon density). Historical landcover, therefore, can have a strong influence on current service provision. By ignoring such time-lags, we risk drawing incorrect conclusions regarding how the distribution and quality of some ecosystem services may alter in response to land-use/cover change. Although such a finding adds to the complexity of predicting future scenarios, ecologists may find that they can link the biodiversity conservation agenda to the preservation of cultural heritage, and that certain courses of action provide win-win outcomes across multiple environmental and cultural goods. Zhang Liwei, Lü Yihe, Fu Bojie, et al. Mapping ecosystem services for China's ecoregions with a biophysical surrogate approach. Landscape and Urban Planning, 2017, 161: 22-31. Spatially explicit mapping of ecosystem services (ESs) is an essential step in drawing up policies and practices designed to improve human well-being by ensuring the sustainable provision of ESs. This study used a set of quantitative surrogate biophysical indicators to map the capability of China's eleven ecoregions to provide four types of ESs (carbon capture, soil protection, water purification and provision, and habitat provision) from 2000 to 2010. The results revealed the spatial distribution patterns and time trends of the ESs of the eleven ecoregions in China. This study shows that: (1) the average annual total value of ESs provided from 2000 to 2010 increased from northwest to southeast, and in the Middle and lower reaches of the Yangtze River as well as over the entirety of the Yunnan-Guizhou Plateau and South China ecoregions; (2) the temporal trends of annual total ESs from 2000 to 2010 showed increases in most ecoregions except those of northeast China and northern China, which experienced decreases; and (3) the surrogate biophysical method for mapping the spatial and temporal characteristics of ESs gives acceptable results, especially at large spatial scales, compared to research results obtained using more complex modeling approaches. Thus the simple surrogate approach is suitable for the rapid assessment and long-term dynamic surveillance of ESs at broad spatial scales, and for tasks such as priority setting or performance assessments for nature conservation and ecological restoration with ESs as key targets. The methodology is also suitable for land-use impact analysis and trade-off analysis concerning land-use decisions in terrestrial environments. Feng Qiang, Zhao Wenwu, Fu Bojie, et al.
. Science of the Total Environment, 607-608: 1250-1263. Soil erosion control (SEC), carbon sequestration (CAS), and soil moisture (SMO) strongly interact in the semi-arid Loess Plateau. Since SMO has supportive effects on SEC and CAS, it can be considered as ecosystem service (ES), and there is an immediate need to coordinate the relationships among these ecosystem services (ESs) to promote the sustainability of vegetation recovery. In this study, we quantified the ESs, ES trade-offs, and the environmental factors in 151 sample plots in the Ansai watershed, and we used a redundancy analysis (RDA) to clarify the effects of environmental factors on these ESs and their trade-offs. The results were as follows: (1) the general trend in the SEC of vegetation types was Robinia pseudoacacia (CH)02>02native grass (NG)02>02small arbor (ST)02>02 Hippophae rhamnoides (SJ)02>02artificial grass (AG)02>02 Caragana korshinskii (NT)02>02apple orchard (GY)02>02crop (CP); the CAS trend was CH02>02SJ02>02NT02>02AG02>02CP02>02ST02>02GY02>02NG; and the SMO trend was CP02>02NG02>02GY02>02AG02>02SJ02>02ST02>02CH02>02NT. (2) For SEC-SMO trade-offs, the influence of vegetation type, altitude, silt and sand composition was dominant. The arrangement of NG, AG, and SJ could decrease the extent of the trade-offs. (3) For CAS-SMO trade-offs, vegetation coverage and types were the dominant factors, but the effects were not complex. The extent of these trade-offs was lowest for NT, and that for SJ was the second lowest. (4) Considering the relationships among the three ESs, SJ was the most appropriate afforestation plant. Combing the vegetation types, slope position, slope gradient, and soil properties could regulate these ES relationships. The dominant factors influencing ES trade-offs varied among the different soil layers, so we must consider the corresponding influencing factors to regulate ESs. Moreover, manual management measures were also important for coordinating the ES relationships. Our research provides a better understanding of the mechanisms influencing the relationships among ESs.